According to Hubspot, a buyer persona is a semi-fictional representation of your ideal customer based on market research and real data about your existing customers. These personas are essential for marketing efforts, as they help you define whom you’re creating content for, what your audience cares about, and what they need to move through the buyer’s journey. As you can see in the above example, spelling out the details with a fictional character makes it easier/more effective for marketers when creating materials for the company’s target buyers. Rather than creating mass materials that appeal to all, buyer personas act as a framework for building more personalized, relevant content. This content addresses specific needs, concerns, and pain points felt by the most ideal, likely to convert customer demographics. And buyer personas do work: MarketingSherpa data found that by using them, length of visit increased by 900%, revenue increased by 171%, and pages visited increased by 100%. Their usefulness has contributed to their mass-adoption, too: As of 2015, 85% of surveyed marketers said they were using buyer personas for content marketing and messaging. But that doesn’t mean everyone’s getting the most out of their buyer personas. Data indicates only 15% feel their buyer personas were very to significantly effective. We want to help fix that. In this post, we’ll look at how you can develop, optimize, and deploy highly effective buyer personas that not only make your marketing efforts more effective, but that also contribute to better lead scoring and sales conversion, too. Step one to strong buyer personas is all about research and data collection. The reason: Data and research help you build more accurate, successful personas rather than making guesses at whom your most ideal target customers are. Although you’re likely already gathering user data, it’s important to make sure you’re optimizing that process to get high quality information through your various channels. Keep in mind that this process will take time: Data shows that persona development time on average takes anywhere from a few weeks to two or three months. Pace yourself. This is the most basic aspect of your buyer persona research, as it’s often the first touchpoint a lead encounters along the customer journey. Here, you can learn your leads’ names, job type, and email address – but it’s best to keep data collection to a minimum at this stage. Short lead forms that only collect the most essential user data (like field of interest, company size, job title, etc.) work better than long ones, simply because they require less time and effort on behalf of the user. Think about it: How often do you complete a form with 10+ fields? Probably rarely, if ever. HubSpot, in their experience, estimates that the optimal lead form is seven fields or less – so keep that in mind. Make your lead forms more enticing with a value exchange or limited-time offer and a creative CTA, like the one pictured above. On the marketer side of things, interactive content is valuable because it can help gather important data beyond or in addition to lead forms that can be leveraged for buyer personas. User inputs, answers, and actions can be analyzed and categorized on the back end by the marketing team. As an example: ServiceNow implemented an assessment to help better learn how advanced different leads processes were. Questions like “Are your IT service requests made primarily by emails, phone calls, walk-up…and smoke signals?” filled in the blanks for marketers who needed to know more about a buyer’s process. With questions tailored to subtly evaluate the user and inform the marketing and sales teams, it’s not hard to see how interactive content becomes an extremely important facet of ongoing work with perfecting buyer personas. Social media platforms also offer a place for you to gather important insights that mold your buyer personas. With monitoring tools such as Social Mention or Hootsuite, you can gather information about your customers’ feelings, buying habits, connections, cultural interests, and preferences. Monitor customer action across social platforms and websites. If a lead liked a Facebook post and commented on a blog article, you need to know both — and connect them to the same prospect. This might mean robust spreadsheets, but the data is valuable. Identify relevant conversations and feedback with one of the tools listed above. Search out important keywords that relate to your marketing efforts. Explore trends over differing periods of time — both in the short term and the long term — across different groups of people. Make notes of trends and patterns. Real-time platforms make it easy to consult data when making marketing decisions. Transform these numbers into meaningful conclusions for your team, and then apply them to your evolving personas. Sometimes the best way to shape your buyer personas is by going right to the source with interviews. Reach out to some of your real life customers and clients to get a deeper understanding of what they need. Ask about fears, motivations, and personalities – and strive to speak with three to five people for each persona (one per week is a good pace.) If participation lags, you may consider offering prizes or small gifts in exchange for their time. Once you’ve collected your data, you’ll want to start building and refining your buyer personas by following key best practices. If your personas aren’t effective, your marketing messages will fall flat – so this stage is important. We asked a handful of content and demand gen marketers for their advice on using personas. Your personas, although fictional, should feel like real people. It’s a good idea to print up your personas and keep them posted nearby so they’re top of mind when you’re creating marketing materials, sounds crazy but this is actually rather popular. All your guesses and assumptions need to be traded in for hard facts and data. Don’t rely on guesswork when it comes to your marketing investments. For higher ROI, be sure to lean on interviews and feedback that come straight from your most reliable source – your customers. In order for you to reach your target buyer personas, you’ve gotta be where they are. Find out where they go for the type of information you can deliver, whether that’s Twitter, niche blogs, or elsewhere. This way, you’ll invest in paid media and time spent promoting content in all the right spaces – instead of wasting precious time and money promoting your brand in non-relevant places. Rather than asking for non-relevant information that doesn’t improve your marketing or sales efforts, be sure you’re focusing on data that matters. If you’re selling cloud storage, for example, where your lead lives isn’t all that relevant to your efforts. Pay attention to details that matter, and leave the rest out. The final step to highly successful buyer personas is to think beyond static characters and to create content based on where your various buyers are within the overall buyer’s journey. Sure, you might have two to four main personas, but those personas are going to have different needs based on if they’re ready to buy – or they’re just getting to know you and your brand. In content marketing, we create buyer personas so we can tailor each new piece of content to that buyer’s unique needs and interests. And those needs and interests change at each stage of the buyer’s journey – so we need to create content that maps at each stage. 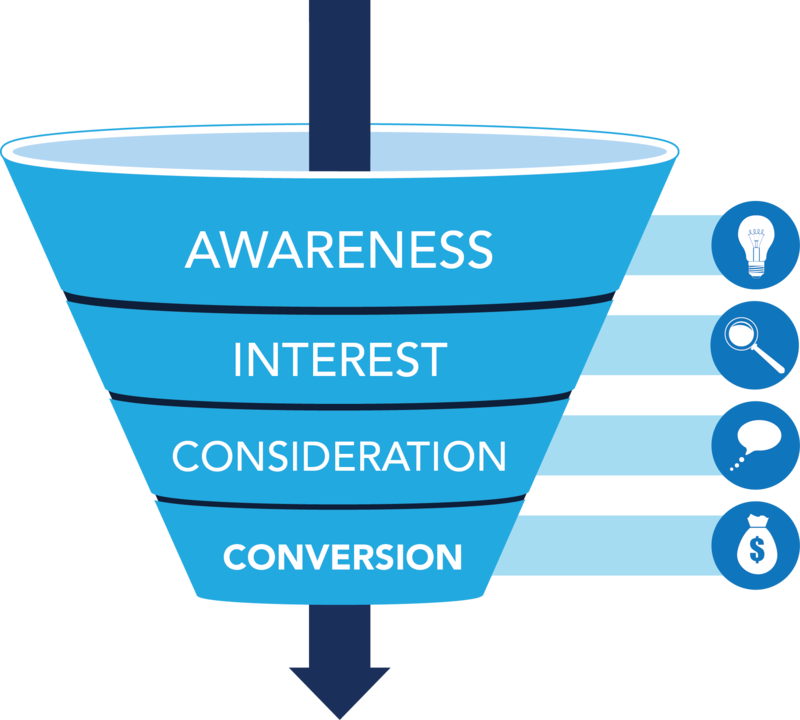 What leads are looking for at the bottom of the funnel is very different from what someone who’s not really sure what exactly they need is browsing. However, by creating different assets for those at varied stages of the lead/sales funnel, you create a more personalized experience for all. The bottom line: Buyer personas work best when thought of as more than a static character. With data-based buyer personas that are constantly being studied, improved, and tweaked for greater accuracy your marketing efforts can become a lot more worthwhile. Remember to follow the best practices and to consider the needs of your personas at different stages of the buying cycle – and your sales team will constantly have a stream of highly qualified leads to follow up with and convert into customers. Final closing thought: Personas are also just people – they leave work, they have lives, friends, interests outside of their industry. Keeping this in mind can help create more resonating content themes, language, and topics. Subscribe to the SnapApp Blog!